An adult female bald eagle. Photo by Robert Lin. The new generation of wildlife tracking devices has opened up the possibility of addressing a broad range of questions that researchers could not have dreamed of answering just a decade ago. For many species of birds we are now able to examine their daily and annual lives in a way never before possible. Partly because of their large size, bald eagles have been at the forefront of exploring the limits of this technology. In the summer of 2007, in a joint project with the U.S. Department of Defense, CCB initiated one of the largest eagle tracking projects in the world. 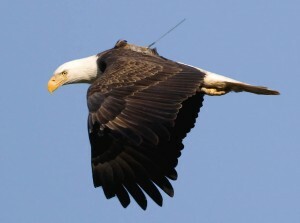 Using GPS transmitters, the project was designed to record movements throughout the Chesapeake Bay and beyond in an effort to understand how eagles use the landscape and how they relate to humans. 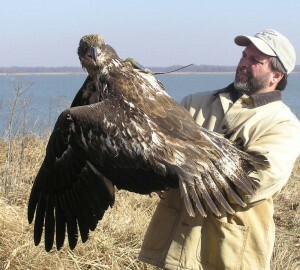 Bryan Watts holds a satellite-tagged second-year juvenile bald eagle before its release. Photo by Libby Mojica. Since that time CCB has continued to deploy GPS and GSM transmitters in other locations throughout the Bay. 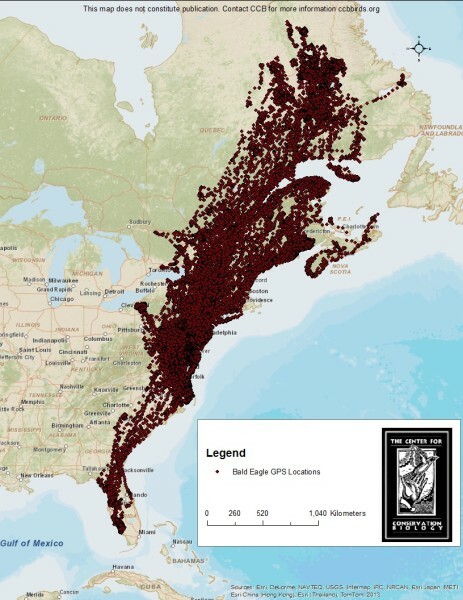 To date, transmitters have recorded approximately 1 million GPS locations and are revealing patterns of movement throughout eastern North America. Night locations have been used to delineate more than 200 communal roosts within the Chesapeake Bay and have supported previous CCB research that has identified concentration areas for non-breeding eagles. In the long term, information gained from these birds will help us to better understand eagle ecology and how to better manage this species within an increasingly human-dominated landscape. Click here to visit the CCB EagleTrak Blog. Map of bald eagle locations 2007-2014. Map by CCB. Meet our newest addition to CCB’s EagleTrak project, Grace! 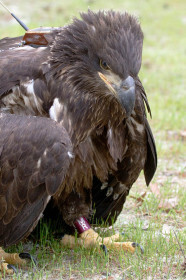 This female bald eagle was banded and tagged with a satellite transmitter in Virginia Beach, VA. Frequent updates will be posted on our CCB EagleTrak Blog.